Ok enough of my whinging. I made this roast leg of lamb last Saturday as hb has been craving for a good roast lamb for a while now. Usually I will only buy lamb chops but this leg of lamb was a good change. No....I didn't slaughter any of the sheeps from the paddock but yeah we feasted on their cuzzie bro ahakksss. I bought it at the halal butcher, weighing almost 2.5kg and cost $30 and lasted for 2 nights dinner (2nd night dinner was roasted lamb and cheese sandwiches) and 1 lunch...hehehez a very gd deal aye?? 2 red onions cut into halves. Note the weight of the lamb and leave at room temperature, covered for 30 minutes. Pierce with a sharp knife and add slithers of garlic and rosemary sprigs. Place red onions beside the lamb. Brush with oil, season and place on an oven rack in a roasting dish. Squeeze the lemon juice over the lamb just before putting it into the oven. 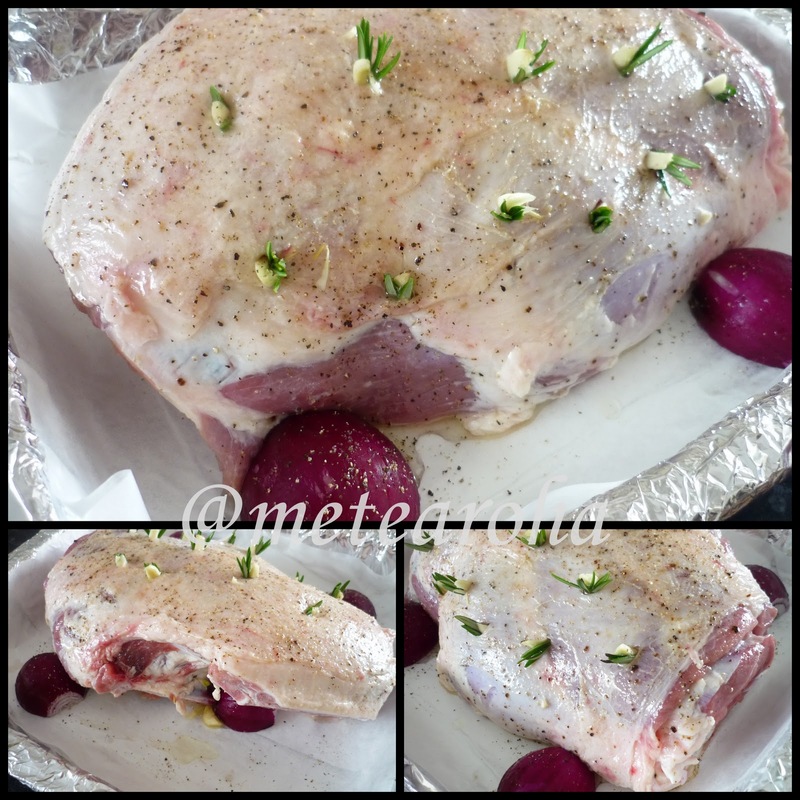 Preheat the oven to 170ºC and roast the lamb for 15-20 minutes per 500g (fan-forced) or until cooked to your liking. Insert a skewer into the thickest part of the leg to the bone, and when the juices run clear the lamb is cooked. Total cooking time for mine was 2hr and 30 mins. 30 minutes before I remove the lamb from the oven, I added the veggies into the roasting pan. I added the potatoes first and let it cook for 15 minutes than add the rest of the veggies except corns which were roasted on its own. Remove from the oven and rest 25 minutes in a warm place before carving. After roasting the lamb for 2.5hrs and half an hour for the veggies. Lamb NZ ni tak bau hanyir so rasanya lagi sedap hehehez ;) Tapi anie rasa lamb dkt M'sia pun importkan? Bukan dari NZ ke? u sembelih kambing kat ladang u eek? bertuahnya kalau gitu.. kami ni kena setel kat hypermarket lah kalau nak spesis nih.. btw, hak u punya nampak fresh je.. gebu! hehe.. meh sini, nak rasa sikit. tak tahan tau tengok je..
walaupun sesetengah org kata ada bau...tapi akak sukeee sgt.. I cuci dgn tepung lamb ni, jadi takde bau hanyir langsung. Maybe perahan lemon juice pun tolong eliminate the smell....sedap ajer kak juicy jer dagingnya. You makan my Shaun the Sheep ke? Alaaa... nak nangesh.. I bought roti Arab yg leper2 tu hoping that I'd be rajin enough to make its filling. I think filling yg sesuai would be the leftover of your roasted lamb, kankankan? haha...ketawa kak nur baca ur comment..hmm lady gaga...ok juga lah menghiburkan...kat Malaysia pun ada satu icon lady gaga..haha. Tu lamb if my hubby tengok pasti jatuh tergulek2...febret dier tu...nampak super yummy...kak nur pun suka lamb...take care dear. Mmg my hb punya feveret lamb ni, I mkn tu mkn jugaklah cuma sikit2 jer....u take care too kak. akak memang suka makan daging kambing panggang tapi tak boleh lah selalu nanti my cholestrol turun naik nanti.